Sometimes, the least complicated works of art can be the most beautiful. 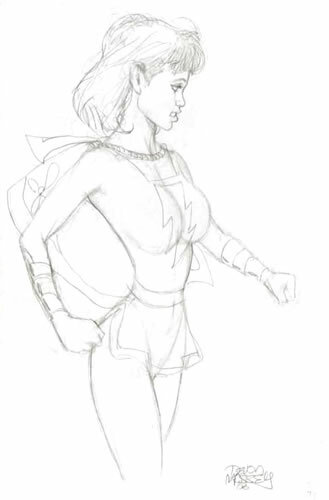 As an illustration (pun intended) of this principle, take this sketch of Mary Marvel, drawn by Cavewoman artist Devon Massey. The linework here is a model of simplicity. (I suspect that this was a preliminary draft for a more detailed drawing.) And yet, with just a handful of deft pencil strokes, Massey gives Mary a sweet, charming face, and her figure the appropriate balance of delicacy and strength. My Mary Marvel galleries contain nearly two dozen stunning renditions of the World’s Mightiest Maiden. Devon Massey’s creation stands out among them for its evocative simplicity. And that, in simple terms, is your Comic Art Friday. This entry was posted on June 12, 2009 at 8:45 am and is filed under Comic Art Friday. You can subscribe via RSS 2.0 feed to this post's comments. You can comment below, or link to this permanent URL from your own site.